Both Christmas Eve and Christmas Day were really fun days for me and my family. I ate good food (entirely too much), caught up with family members, and exchanged gifts. Of the gifts I received, one of my favorites is the sweatshirt I'm holding up in the photo above. 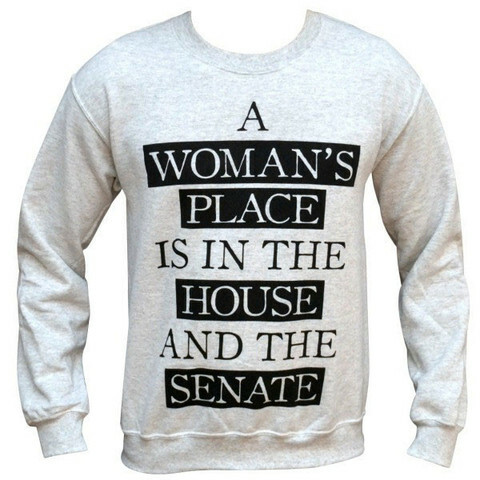 I spotted this sweatshirt with the words, "A WOMAN'S PLACE IS IN THE HOUSE AND THE SENATE," on Pinterest back in the summer and I sent the link to my boyfriend requesting it as a Christmas gift...and he delivered! As a political junkie and feminist, I love this sweatshirt's message and the design that makes it wearable with just about anything. I shared it on my personal social media pages and had several people ask me where they could order it, so I thought I'd also share it on my blog. My sweatshirt was ordered from Wicked Clothes and the quality is really great. The sweatshirt may be available other places, but I cannot verify that it will be a quality product. You can pre-order the shirts here! They sold out, but should be back in stock soon. I've already worn mine three times! This made me smile, what an awesome sweater! I'm sure you will wear it proudly!